Proffering how "national sorrow has created political momentum before," Wednesday's NBC Nightly News devoted a story to the hope of Democrats that Senator Ted Kennedy's passing will propel ObamaCare to victory. Noting how Kennedy was "passionate" about more government in health care, from Hyannis anchor Brian Williams proposed "ironically, the fact that he did not live long enough to see a possible overhaul of the system" raises the question: "Will this be the very thing that might break the log jam over getting it done? Or not?" Within months the Civil Rights Act passed with young Senator Kennedy's help. Today, a similar suggestion from House Speaker Nancy Pelosi: "Ted Kennedy's dream of quality health care for all Americans will be made real this year because of his leadership and his inspiration." And outside groups were even more direct. The seniors lobby, AARP, wrote: "As Congress seems poised to act this fall, Senator Kennedy will no doubt be watching." And the service workers union said: "Let us continue his cause. Let us take action this year to pass health care reform." We thought one way to look at his life might be the way some people looked at him today, the way filmmaker Frank Capra might have looked at life: What would it have been like without a Ted Kennedy? Kevin Tibbles concluded with how "many say Ted Kennedy's passion was people and tonight they have lost a champion." BRIAN WILLIAMS: Now let's get into the political piece of all this. As you've heard the Democrats have sorely missed Ted Kennedy's voice, his leadership, in this health care debate this summer. It's an issue, as we just heard, the Senator was passionate about, passionate enough to bang a sailboat with his fist. And now, ironically, the fact that he did not live long enough to see a possible overhaul of the system. Will this be the very thing that might break the log jam over getting it done? Or not? NBC's Kelly O'Donnell is on Capitol Hill tonight with this part of the story. Kelly, good evening. KELLY O'DONNELL: Good evening, Brian. In months of contentious debate over what to do about health care we've heard claims from both Democrats and Republicans that the tone and outcome might have been different had Senator Kennedy really been able to participate. That may be true or not. But looking forward, the emotional impact of Kennedy's passing could become a factor now. 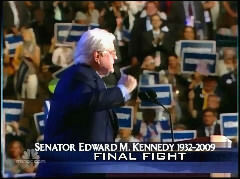 TED KENNEDY: This is the cause of my life. O'DONNELL: One year and one day ago, Edward Kennedy declared that Washington was ready to reform health care. KENNEDY: And guarantee that every American north, south, east, and west, for all Americans as a matter of right and not a privilege. O'DONNELL: The same fight he had waged for decades. O'DONNELL: This year Kennedy's shadow has hung over the health care debate. SENATOR CHRIS DODD IN HEARING: I talked with Senator Kennedy earlier this morning and he wishes he could be here. O'DONNELL: But the government run insurance plan he wanted has stalled with no Republican support and the White House saying it is not essential to fix health care. But Democrats are saying, respect for Kennedy could change minds now. STEVE McMAHON, DEMOCRATIC STRATEGIST: The ironic thing is that now that he's not there it might finally get done, it might be an opportunity for Democrats and Republicans to come together. O'DONNELL: National sorrow has created political momentum before. PRESIDENT LYNDON JOHNSON: No memorial oration or eulogy could more eloquently honor President Kennedy's memory than the earliest possible passage of the civil rights bill for which he fought so long. O'DONNELL: Within months the Civil Rights Act passed with young Senator Kennedy's help. Today, a similar suggestion from House Speaker Nancy Pelosi: "Ted Kennedy's dream of quality health care for all Americans will be made real this year because of his leadership and his inspiration." And outside groups were even more direct. The seniors lobby, AARP, wrote: "As Congress seems poised to act this fall, Senator Kennedy will no doubt be watching." And the service workers union said: "Let us continue his cause. Let us take action this year to pass health care reform." But Republicans, even close friends of Edward Kennedy, say admiration will not swing many votes. SENATOR ORRIN HATCH: I don't think anybody should try to take advantage of the current situation, Teddy's death, to try and push something that really doesn't merit bipartisan support. O'DONNELL: Some Democrats say the bill should ultimately be named for Edward Kennedy. And Brian there was another gesture here tonight. The Senator's desk on the Senate floor has been draped in black. There is a vase with white roses there along with the Robert Frost poem., the Road Not Taken. As you know that was also the desk used by John Kennedy when he was a Senator. Brian.